We are excited to introduce our upcoming promotional tour for David LeRoy’s debut novel: The Siren of Paris. Rich in historical detail and full of suspense, this book explores the journey of one American from medical student, to artist, to political prisoner at Buchenwald Concentration Camp during World War II. Ocean liners and transportation issues after the outbreak of World War Two. The RMS Lancastria, the single largest loss of life ever on a British ship, covered up during the war. 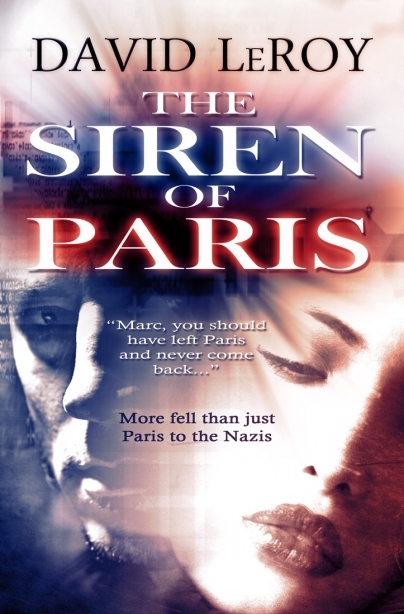 The Siren of Paris will appeal to serious history buffs as well as fans of action/adventure novels and lovers of historical fiction. We hope you will enjoy sharing it with your readers. This is a well-written and well-researched story that takes the reader to Paris and its surroundings during WWII as viewed through the experiences of Marc Tolbert, an American who was born in France. The characters are well-developed and we get to know many of them as well as we might know our friends. The scenery is vividly painted and one feels like they are there watching the events unfold. I’ve just finished reading Siren of Paris by David LeRoy and it’s a story that will stay with me for a while. It has a complex, well developed plotline and presents the story in a tantalising way, jumping back and forth between 1939-40 and 1943-44. As I pondered developments in the story important elements of the plot were revealed at just the right moment. I’ve read quite a few books set during the Second World War and often find them very moving. But this one especially gripped me. The author’s meticulous historical research really shines. Events are described in incredibly vivid detail and in a very personal and human way. For example, we see detailed news footage of the German invasion of France. We see people cramming themselves into and piling on top of train cars, trying to escape the country. We experience the destruction of an ocean liner, are drawn into the intrigue of the French resistance, and feel a character’s psychological deterioration in a prison camp. The novel also touches on the post traumatic stress the protagonist suffers after the war. I also liked the spirituality that runs through the novel. We see a priest who is well versed in dogma and without compassion contrasted with a loving, spiritual man of God. This story explores themes of faith, despair, betrayal, guilt, forgiveness, redemption, and the pivotal choices that make us who we become. There are also lightly rendered paranormal elements and interesting dream/hallucination sequences as well as a wise, thoughtful moment, at the end, where Marc’s spirit realizes what he needs to achieve peace. While it is packed with information, The Siren of Paris is readable and entertaining. This is an excellent living history book for adults and mature teens. … The story tells of friendship, love, betrayal, guilt and forgiveness. The vivid imagery … captures the meaning of the war and experiences of the characters … As the story progresses the reader can understand how Marc’s past experiences are an important part of the present. Marc’s recollections fall into place as the layers of his life experiences throughout the war unfold. I highly recommend the book as poignant, compelling, and provocative. The book provides an excellent historical chronicle of life during World War II in France and the importance of the Resistance. I really enjoyed this book. The style is smooth and easy to follow, the characters are thoroughly developed, believable, and very human, and the plot is entertaining from start to finish. The content is intelligent without being pretentious, haughty or boring, and it is often spiritual or philosophical without being preachy or dogmatic. I’ll read his next work.The use of historical characters and events is especially good. These elements add considerable depth, but don’t take over the story. Several times, I found myself looking up information online about some of the truly unbelievable, yet actual events that the author incorporates into his piece. A Native of California, David received a BA in Philosophy and Religion at Point Loma Nazarene College in San Diego. The degree served him well while selling women’s shoes, waiting tables, or working odd jobs after college until settling in the field of telecommunications, where he has worked for the past 18 years. Early on, he demonstrated artistic abilities. For many years, David marketed a line of fine art photographic prints through various galleries and retail outlets. After returning from a European arts study program, he became interested in the history behind the French Resistance during World War Two. Writing fiction has become his latest way to explore philosophical, moral and emotional issues of life. The Siren of Paris is his first novel. For more information about this novel visit http://www.thesirenofparis.com/.